Monroe Road Retail in Charlotte's mixed use development community of Meridian Place. 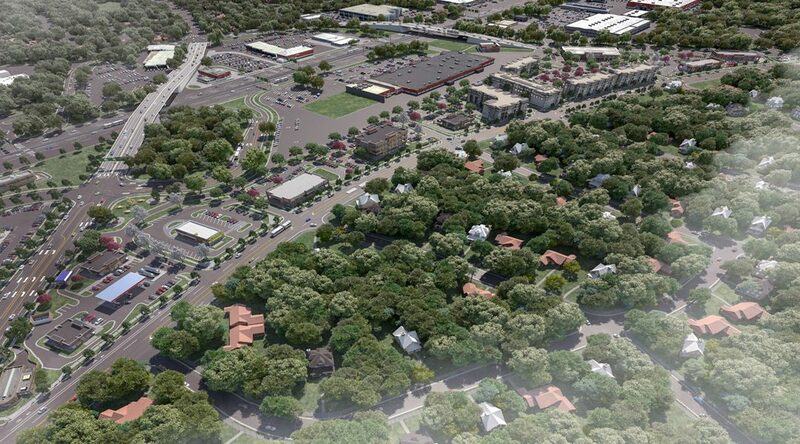 Meridian Place’s master plan includes a mix of retail spaces and build-to-suit opportunities along Monroe Road, Idlewild Road and Conference Drive for retailers and restaurants interested in an attractive location with high visibility made most attractive by Independence Boulevard Freeway Extension project. Interchange improvements at Idlewild Road and Conference Drive provide Meridian Place retailers and their customers a variety of convenient access roads and the scale of an attractive mixed-use community. Local favorite Hawthorne’s NY Pizza anchors the10,000 square foot retail building located near the Embrace sculpture and the intersection of Monroe Road and Old Post Road. Hawthorne’s offers both indoor and outdoor dining as well as a rich array of dishes, craft beers and wines. Rex Cleaners provides alterations as well as dry cleaning services to those living and passing by the MoRA area while Wingstop is the most recent, popular eatery to open at Meridian Place. Sprint has opened in Meridian Place’s second building, and interest in the community’s retail offerings continues to grow with the evolution of the MoRA area. 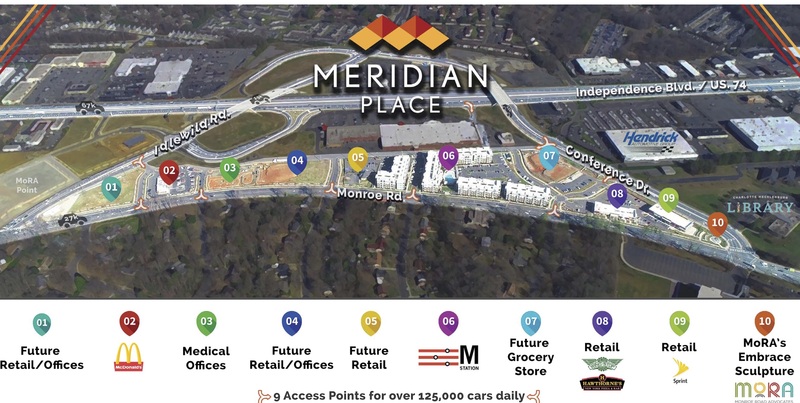 Customer bases for retail and restaurants at Meridian Place range from the M Station apartments and the many residents in the neighboring MoRA communities to the more than 3200 students and their families served by East Mecklenburg High School, McClintock Middle School and Rama Road Elementary as well as the many commuters using Monroe Road, Idlewild Road and Conference Drive each day. Childress Klein represents developer Goode Properties for the retail offerings at Meridian Place and is committed to obtaining an attractive tenant mix for the property including community and service oriented retailers, restaurants, coffee shops and perhaps a brewery. For more information on retail opportunities at Meridian Place, contact Susan Clements. The vision of Meridian Place is to respond to the requests of MoRA residents by combining neighborhood shops and offices with inspiring apartments, art and gathering places that fulfill the needs of this evolving community.